Note: Pink color is no longer available. Our Reflective Tiny Dog Vest is designed for the tiny working dog. It is made with weather resistant 1000 denier nylon/urethane coated fabric and lined with quilted fabric for comfort. 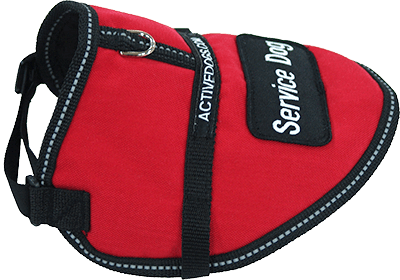 The seams of this vest are bound in reflective webbing as an added safety feature for your dog. The front chest and the girth straps are adjustable. There is a D-ring for attaching a leash. The vest comes with 1 patch of your choice (not specialty patch). We sew this patch on for you. You may purchase additional patches, and we will also sew them on FREE of charge. Please specify where you would like your patch(es) located on your vest in the “Patch Placement” field in the shopping cart. e.g. Service dog patch left, middle.